So here I am tipping the scale at 269pounds. 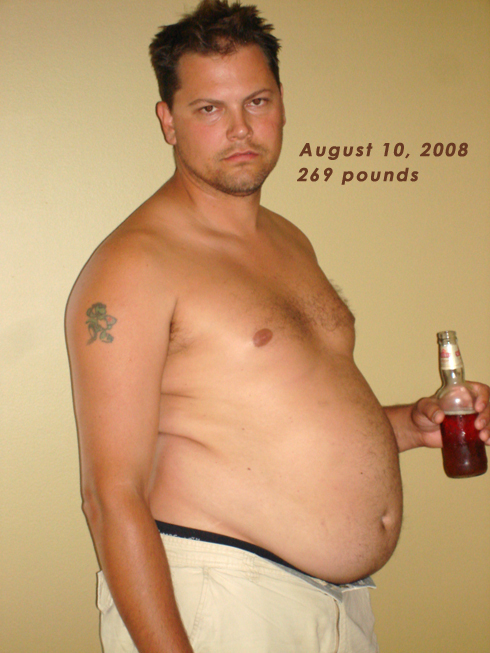 Tomorrow I am starting a rigorous health plan with the goal to lose 50 pounds by Christmas 2008. I hope others can gain something by following my highs and lows. I also hope that some can offer encouragement or stories of their triumphs as they may have done the same as what I am hoping to do. I gain confidence looking at those slim arms! Tommorow – all that changes. I know the first couple days will be the hardest – no carbohydrates, no beer, no pizza, no, no, no!!! I have many challenges in the coming weeks including a wedding and a week long holiday at the lake. I am doing this for my health and for my family. I am diabetic with excellent control but the doctor tells me the weight and lack of exercise are my biggest problems. I currently give 6 needles per day to control my diabetes. With this new program I hope to reduce that to 2-3 injections only. I am very lucky to have a wife so supportive and encouraging as mine. Right now she is creating meals specifically designed so I can eat a lot but not go outside of the South Beach Program. Lasagna with no noodles, kiesh, chicken – its all going on the stove at once so that starting tomorrow I don’t have to reach for something bad in order to make myself feel good. I wish you all the very best in your quest to become fit!